Paseando por las calles de Betanzos encontré esta puesta tan original. So true on they most likely are a horse lover. Horses would be so fun. I've always been bit scared of them and only gone horse back riding a few times. Thanks for sharing your building find at Pictorial Tuesday. How interesting! Fun! Thanks for sharing this creative find! 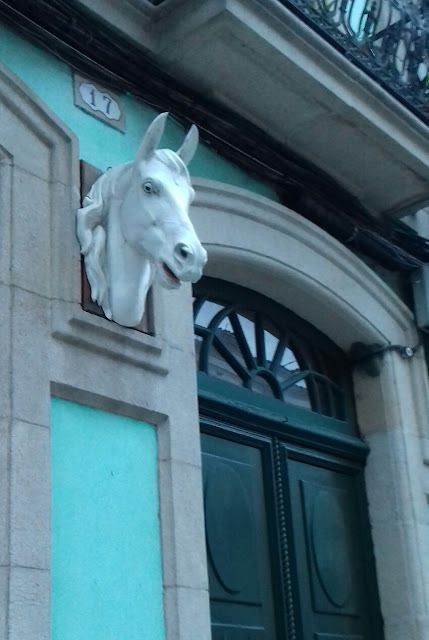 Yes, probably horse lovers -- what a fun decoration. Ha ha - how original! The horse surprised me! Thanks for sharing.